LOCATION OF INCIDENT: US31 Bypass exit 3 and East US12 Bertrand Township, Berrien County, Michigan. 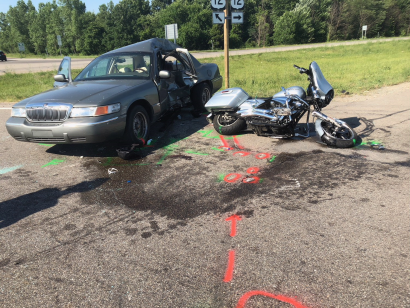 On 07/09/18 at 1536 hours the Berrien County Sheriff Office responded to the intersection of US 31Bypass North bound exit ramp and East Bound US12 for a serious injury Motor vehicle Collision. During the investigation it was found that a gray Mercury driven by 23 year old Brian Elleott of South Bend Indiana failed to yield right of way when entering onto US12 and pulled into the path of a Harley Davidson Motorcycle driven by 18 year old Dakota Cowan of Galien Michigan traveling East bound on US12. The Mercury was also occupied by four passengers 58 year old Sandra Elleott, 35 year old Aaron Elleott, 10 year old Vincent Bowman, and 7 year old Colin Elleott. All were treated for minor injuies at the scene and Colin and Aaron Elleott wear transported to Saint Joseph Memorial Hospital in Indiana for more serious injuries. Both the driver of the motocycle Dakota Cowan and rear passenger 17 year old Searra Inman of Niles Michigan were seriously Injured and transported to Saint Joseph Memorial Hospital in Indiana and are list in critical condtion. It does not appear that Alcohol or drugs were a factor at this time. This incident is still under investigation by the Berrien County Accident Investigation Team.